Over at the Tesla Motors Club forum, a member named Gear posted a number of photos of what is likely an early Model X drivetrain test mule. 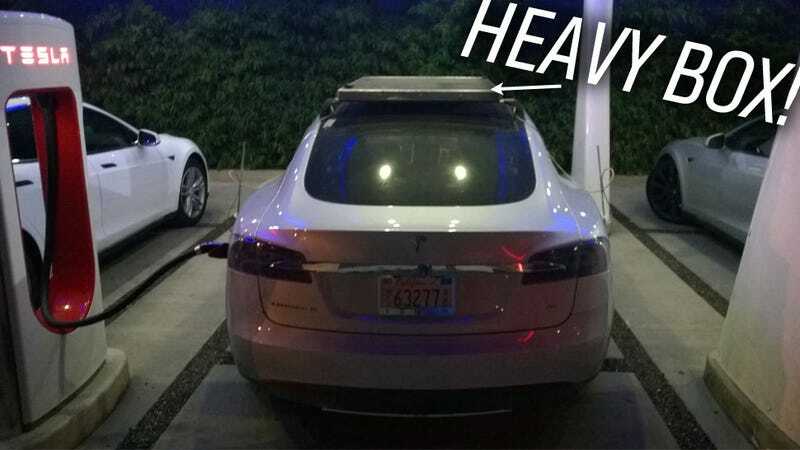 The instrument-laden car was seen at the Hawthorne, CA SuperCharger, and. most notably, sported a big heavy box on the roof. The car also had the usual assortment of test-mule instrumentation, but I think the most interesting thing is that box. I suspect this car has the Model X's AWD drivetrain, which essentially just mounts an additional motor at the front axle as well as the rear. It seems that the weighted box on the roof is used to adjust for the Model X's likely higher COG. The aero effects, of course, would be radically different, but this is an interesting way to adjust the characteristics of the car for testing, and appears to have been used by other manufacturers as well. For a relatively small/lower-volume company like Tesla with only one main model, it's not really shocking to see that one model pushed into all sorts of testing service.